Uses:-Filgrastim Injection is used for decreasing the risk of infection in certain patients, including cancer patients who are receiving chemotherapy. It is also used to raise the number of stem cells or to treat low white blood cell counts. It is also used to increase survival in certain patients who are receiving radiation. Filgrastim Injection is a hematopoietic agent. It works by stimulating the production of neutrophils (a type of white blood cells) by bone marrow. 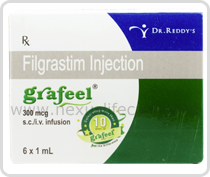 Filgrastim Injection available as Neupogen 300mcg injection, Grafeel 300 mcg injection. Side Effects:- Back pain, bone or muscle pain or ache, cough, headache, joint pain, nausea.